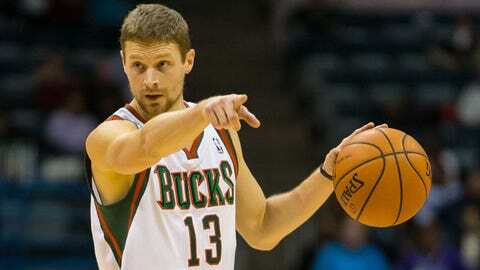 Point guard Luke Ridnour is averaging 5.1 points and 3.3 assists in 20.3 minutes per game this season for Milwaukee. the veterans who have lost playing time to younger players. him, it doesn’t make sitting on the bench any easier. emergence, the 32-year-old has been the odd man out. Tuesday’s practice at the Cousins Center. “You play in the league to play. Drew decided he had to find a way to play Wolters. been a starter in the NBA for seven of his 11 years in the league. Timberwolves having Ricky Rubio, J.J. Barea and Alexey Shved. happy with his current role, Ridnour has been professional in his approach. a bit of a mentorship role with Wolters. not been the case with any of our guys. understands not every veteran would be willing to do the same. “He’s helped me out a lot,” Wolters said. “He’s a really good guy and has been in the league for a really long time. against San Antonio and 16 minutes against Dallas on Saturday. “I’m not worried about that,” Ridnour said. factor to me. I know good things will come. I have faith and trust in the Lord. games with a swollen left knee. but sat out again due to plantar fasciitis in his left foot. he will have available to him for Wednesday’s game against New York. aren’t accustomed to playing. In all fairness, it’s not their natural position. hamstring) won’t play against the Bucks. was going to attempt to practice Tuesday before deciding whether he can play. of the MACC Fund Center at Children’s Hospital of Wisconsin. donated books for the players to distribute to the kids. he retired during halftime of a game in Milwaukee.